North Star Casino and Bingo bring new meaning to the term "Quick Bite to Eat"! Yes you will get your food in record time and yes the menu is simple but expect great tasting and good quality fare, cheaper than if you went to the store and cooked it yourself, I kid you not! I had a great chicken salad sandwich. I'm not sure if it was homemade but it sure tasted like it. Just the right amount of mayo and seasonings. I ordered vegetable cream soup that had to be homemade, served piping hot. 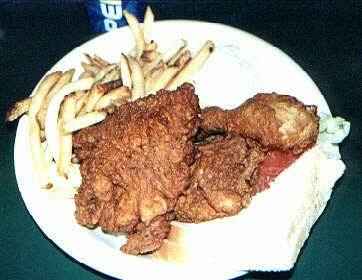 My companion ordered the three piece chicken diner, large plump pieces of chicken, fried to a deep golden brown. The menu is simple yet quite large, offering salads, soups, sandwiches, diners and deserts. The most expensive item on the menu was the chicken dinner for about $5. Soda and coffee are always free. All in all I was impressed by the taste and quality of everything I tried. Whether you are looking for a snack or a meal, your appetite sure will be satisfied.